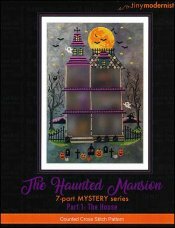 The Haunted Mansion Part One: The House [H1648] - $10.00 : Yarn Tree, Your wholesale source for cross stitch supplies. Cross stitch pattern from Tiny Modernist. It's a dark night with the moon & stars shining brightly. Bats are flaying overhead, while ghosts are lingering in the whispering trees. Pumpkins & tombstones sit in front of the haunted house, welcoming you at the entrance. Welcome to "The Haunted Mansion!" This is part 1 of the 7 part Mystery series. Stitch count is 156w x 224h for the full design.